After winning the Grand Final the previous weekend, most of the La Perouse footy team returned to take part in the Koori Knockout, a collection of matches between Aboriginal football teams within a bracket over three days. The final game is played on Monday afternoon, which is the Labour Day holiday in New South Wales. The winning team (as well as the loser) of the match walks away with a nice sum of money. Unlike the Grand Final, this game is not just about pride. Many of the teams that played during the weekend are made of players that only came together because they thought they could win the cash. 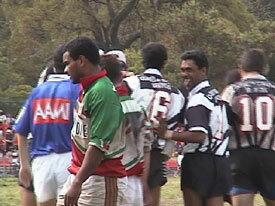 The game seen here was only one of several finals played that day, including a footy match between female teams. 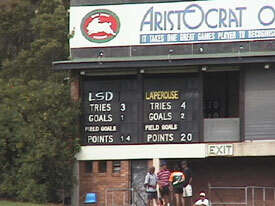 The final match, captured in the movie below, features La Perouse against the Louis Street Dodgers. Many of the players that won the day in the Grand Final also carried the day in this game, including Bunda and Pumpkin. Like the Grand Final video, this movie suffers from too much compression for an action flick. But, until I can get some more disk space and bandwidth, this will have to do. The opening frame of the movie features a scrum, where the ball is passed out by a team and possession begins. The Louis Street team seemed to be much larger than La Pa.
At times, La Pa players were surrounded by the larger LSD players, even if they didn't have the ball. A lot of trash talking and taunts take place on the field, particularly after try is scored. It is crucial to make tackles from below the waist, preferably below the knee. Most of the time, two or more players are required to make tackles, as there are no blockers. Referees always seem to be near the action. This one is signaling a penalty. Open field running is rare in footy games, but when a player breaks free, the game gets exciting in a hurry. 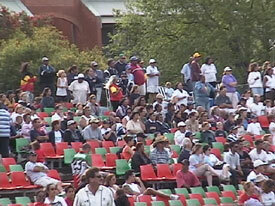 The La Pa fans survey the action. La Pa players passing the ball leading up to a try. 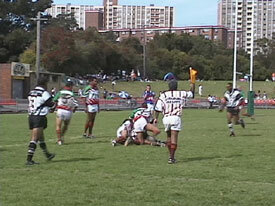 An LSD player returning a kick. La Pa celebrates their win.